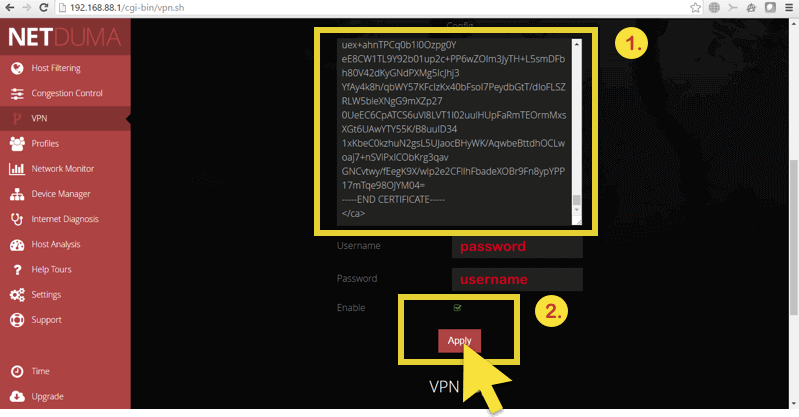 This tutorial is a step-by-step guide to setting up ExpressVPN with OpenVPN on your Netduma R1 router. 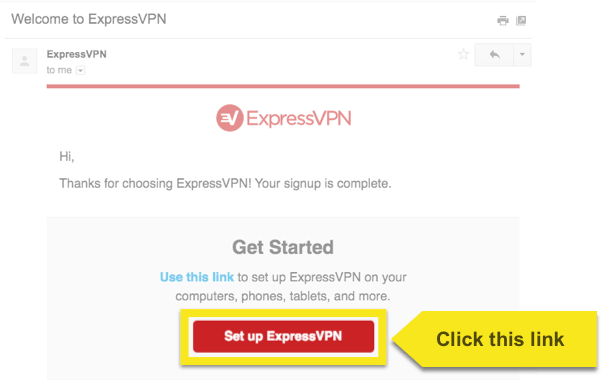 Before you start, make sure you have an active ExpressVPN account and your Netduma R1 router ready. Download and save the .ovpn file(s) or locations (e.g. Los Angeles, New York, etc.) that you wish to connect to. If you’re on Windows, you can use Notepad to open the configuration file. If you’re on Mac, you can use TextEdit to open the configuration file. Keep the file open as you proceed to the next steps. 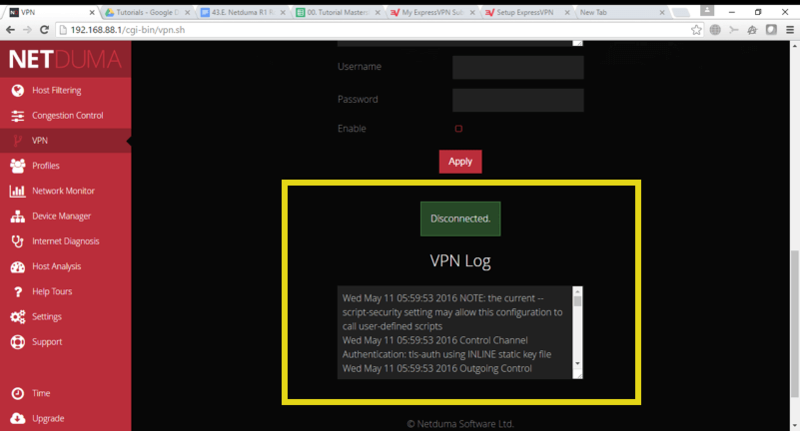 Log into your Netduma R1 router. The router can be accessed by entering 192.168.88.1 into your browser’s address bar (Remember to check your router documentation beforehand. Your router may have a different control panel IP address for the router). 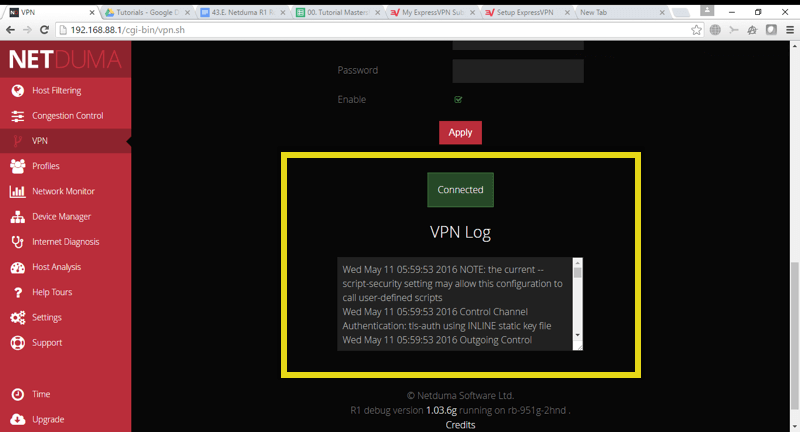 Click on VPN in the Netduma control panel. 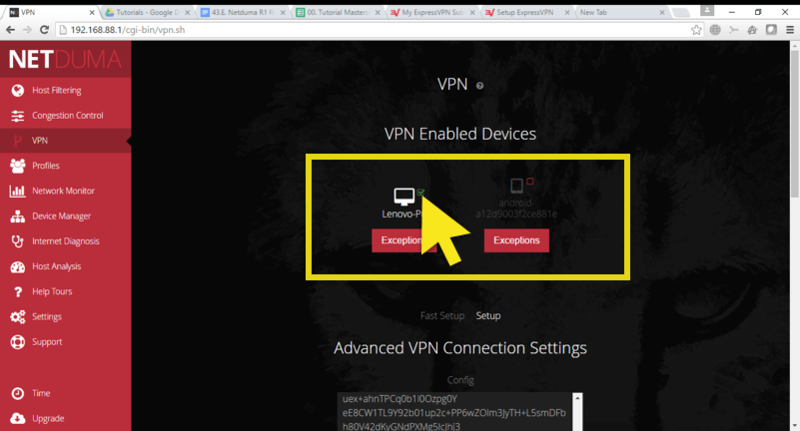 In the VPN menu, select the devices you wish to tunnel through the VPN, then click Setup. You will be taken to the Advanced VPN Connection Settings. 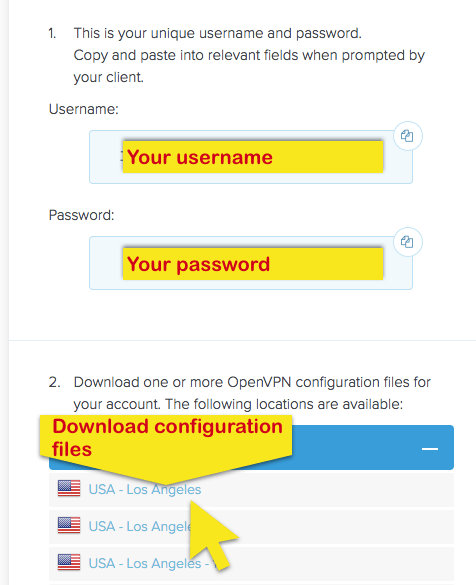 Go to the OpenVPN configuration file you downloaded earlier and copy the entire text. Go back to the Advanced VPN Connection Settings and paste the copied text into the Config box. Be sure to remove any extras after the pasted text. 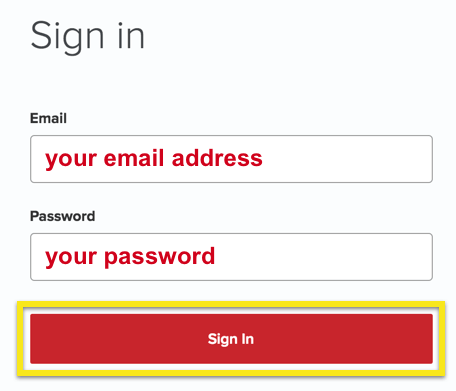 Enter your username and password, check Enable, then click Apply. After connecting successfully, the word “Connected” will appear in a green box, along with the VPN log. To disconnect, uncheck Enable and click Apply. After disconnecting successfully, the word “Disconnected” will appear in a green box, along with the VPN log. To add or remove devices from the VPN, simply check or uncheck the box next to the device name at the top of the VPN page in the router control panel.